Background: Dendritic cell (DC) defects may contribute to chronicity in hepatitis C virus (HCV) infection and determine response to PEG–interferon and ribavirin therapy via poor T cell stimulation. Studies to date have produced inconsistent results regarding DC maturation and function: no large study has examined DCs before and after therapy. Aims: We examined if DC defects in maturation and chemotaxis are present by comparing therapeutic responders to non-responders. Methods: We analysed peripheral DCs of 64 HCV genotype 1-infected patients from the Virahep-C study 2 weeks before and 24 weeks after therapy. We used flow cytometry to enumerate plasmacytoid DC (pDC) and myeloid DCs (mDC) and quantify expression of chemokine receptors and maturation markers. Chemotaxis was measured with an in vitro assay. Results: Pre-treatment frequencies of pDCs and mDCs were significantly lower in HCV patients than controls and successful therapy normalised pDCs. Levels of CXCR3 and CXCR4 on pDCs were higher at baseline compared to normal controls and decreased with therapy. Pre-therapy levels of co-stimulatory marker CD40 and the maturation marker CD83 were higher in pDCs of patients chronically infected with HCV compared to normal patients, and levels of both markers dropped significantly with therapy in the SVR+ group only. Other maturation markers (CD86 and CCR7) were not elevated suggesting a partially activated phenotype. 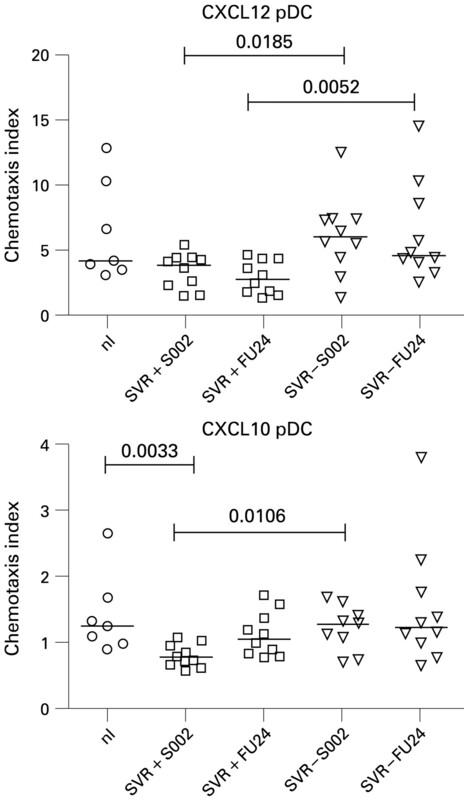 Baseline chemotaxis of pDCs to CXCL12 and CXCL10 predicted failure of antiviral response and correlated with the histological activity index inflammation score. Conclusions: Plasmacytoid DC defects exist in chronic HCV and successful antiviral therapy normalises many phenotypic and functional abnormalities. Reports of global immune dysfunction in HCV infection are controversial; some studies have suggested that HCV patients have poorer response to hepatitis B vaccination15 and higher rates of infection with herpes simplex virus (HSV).16 However, strong global immune dysfunction as seen in HIV/AIDS is not seen. DC dysfunction may be restricted to the HCV-specific response. Studies of impaired DC function in chronic HCV have yielded variable results; most use monocyte-derived DCs from HCV patients, not DCs analysed directly ex vivo. 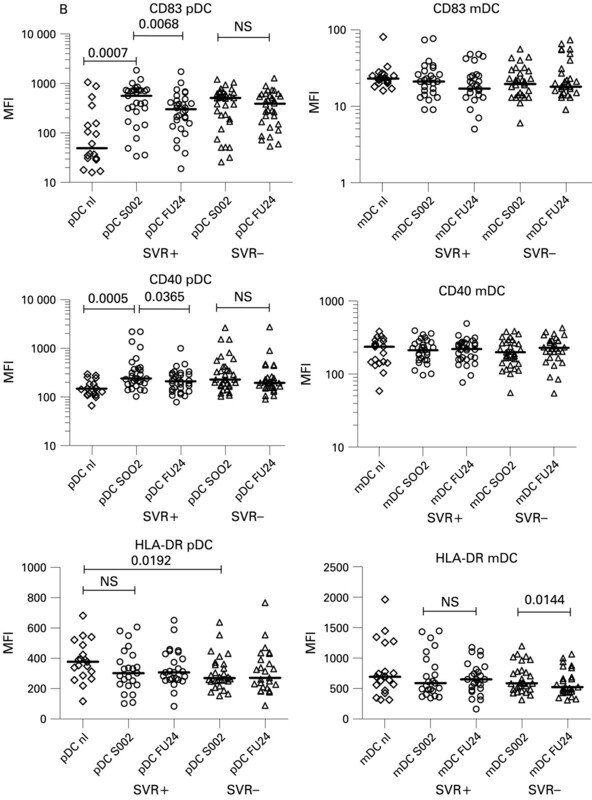 Some authors have found faulty responses to general PRR stimulation including decreased IFNα and IL12 secretion, reduced CD86 expression, decreased HLA-DR (MHC class II) and impaired stimulation of T cells in mixed lymphocyte reaction compared with normal controls.13 17–24 Specific HCV proteins like core and E2 can cause DC dysfunction in tissue culture models.13 19 Other authors, including those using direct ex vivo human samples or a chimpanzee model of HCV have found no defects.13 25–29 It has been consistently shown in HCV infection that pDC and mDC numbers are reduced in the peripheral compartment compared with normal controls, whereas reports have described increased numbers of DCs in the livers of HCV patients, suggesting hepatic DC sequestration.13 18 22 30 31 The unresolved controversies listed above highlight the need for further study of DCs in HCV infection. Chemokines and chemokine receptors are important regulators of DC migration to specific anatomic areas such as lymph nodes and sites of infection, and thus have an important effect on DC function. Chemokines are elevated in HCV patients,32 and in vitro studies have suggested that the HCV protein E2 can inhibit DC chemotaxis.30 Serum levels of the chemokines IL8 (CXCL8) and IP-10 (CXCL10) are elevated compared with normal controls and increased levels are associated with higher HCV viral levels and disease activity while lower levels have been associated with improved response to combination therapy.33–35 Additionally, HCV patients have high levels of CXCR3, CXCR4, CCR5 and CCR7 expression on liver-infiltrating lymphocytes, and the corresponding chemokines for these receptors are also increased in the liver and the plasma.32 36 To date, no large study has examined levels of these receptors on DC subsets or chemotaxis of DC before and after therapy for HCV directly ex vivo. We hypothesised that baseline differences in DC maturation and function may determine an individual’s response to PEG–IFN/ribavirin therapy. We also postulated that patients who ultimately have a sustained virological response (SVR) might show temporal differences in DC maturation and function with therapy. In contrast to prior studies of DC maturation in HCV which used cultured-derived DCs, we studied patient samples analysed directly ex vivo from the large Virahep-C treatment trial. We examined chemokine receptors, maturation markers, and co-stimulatory markers on DC subsets, as well as the ability of pDCs and mDCs to migrate to chemokines relative to histological injury and treatment outcome. For the first time, we demonstrate incomplete maturation of the pDC subtype in hepatitis C, which resolves with successful therapy. We also show that therapeutic non-responders have increased pDC migration to inflammatory chemokines before therapy when compared with therapeutic responders. PBMCs from 20 healthy volunteer patients served as normal controls. The average age of controls was 37; 63% were male, and 50% were AA. PBMCs were isolated from whole blood by Ficoll (Amersham, Piscataway, New Jersey, USA) density gradient centrifugation or cellular preparation tubes (Becton-Dickinson, San Jose, California, USA). PBMCs were viably frozen in 80% fetal bovine serum (BioWhittaker, Basel, Switzerland), 10% dimethyl sulfoxide (DMSO), and 10% RPMI 1640 media (Life Technologies, Carlsbad, California, USA) in liquid nitrogen for subsequent analyses. PBMCs were thawed into RPMI with 10% human serum, and two million PBMCs per tube were stained with the following antibodies according to the manufacturer’s recommendations. BDCA-1,2 and FcR blocking reagent were from Miltenyi (Bergisch Gladbach, Germany). CXCR3, CXCR4, CCR5, CCR7, CD83, CD86, DC-sign were from BD biosciences (Becton Dickinson). CD40 was from Ancell (Bayport, Minnesota, USA). Appropriate isotype control antibodies were utilised. After incubation with antibodies for 20 min in the dark at 4°C, cells were washed once with cold phosphate-buffered saline (PBS) containing 0.6% bovine serum albumin and 0.01% sodium azide and fixed in 2.5% paraformaldehyde. Acquisition and analysis was performed using a Becton-Dickinson FACSCalibur flow cytometer running CellQuest Pro software at the University of Colorado Denver Clinimmune flow cytometry core facility. Because BDCA-1 is expressed on a subset of CD19+ B-cells, we tested for CD19+ cells in the BDCA-1 gate. We found gating on high BDCA-1 expression reduced CD19+ cells to less than 5% of the mDC gate (data not shown). Some patients did not have enough PBMCs saved to analyse every marker therefore small variations occurred in patient numbers per experiment. Twenty patients from the original cohort of 64 patients were chosen for study based on the availability of sufficient numbers of cells for analysis. Seven normal patients from the group mentioned above were used as controls. CXCL12 and CXCL10 chemokines were purchased from Preprotech. Two million PBMCs in RPMI in 10% human serum were added to the upper well of a 6.5 mm, 5 μm pore transwell chamber (Corning, Pittsburgh, Philadelphia, USA).38 The bottom chamber contained the same media plus chemokine. After a 3 h incubation, cells in the bottom chamber were collected using ice cold PBS containing 10 mmol/l EDTA. The collected cells were stained with BDCA-1–APC and BDCA-2–FITC and counted in a BD Canto flow cytometer. Fifty thousand unlabelled beads (Bang Laboratories, Fishers, Indiana, USA) were added to each sample and used as a control for counting efficiency. We performed each analysis in duplicate. We calculated and plotted the chemotaxis index, defined as the ratio of cells migrated with chemokine divided by the number of cells migrated without chemokine. Descriptive statistics, including medians, means, standard deviations and frequencies are tabulated for the raw counts separately for the patient groups. The two-tailed non-parametric Wilcoxon signed rank-sum test was used to compare paired DC measurements before and after therapy. Correlation between chemotaxis and histological activity index were assessed using the Spearman rank correlation coefficient. In order to examine the association between baseline DC measurements and SVR, weighted generalised estimating equations (GEEs) modelling approach (proc genmod in SAS) was utilised. Comparisons in DC measurements between the HCV cohort and normal controls were done by permutation test using a sum of ranks as a statistic since we have relatively unbalanced sample sizes between the two groups. A p value of less than 0.05 was considered significant and not adjusted for multiple testing. Permutation tests were done in R package version 2.7 (available at http://CRAN.R-project.org/). Other statistical analyses were performed using JMP 6.0, SAS 9.1.3 and Prism 5.01 (GraphPad Software, San Diego California USA). Consistent with prior studies,18 19 44 45 we found the percentage of pDCs in chronic HCV patients (median 0.32%, range 0.08–1.44%) was slightly reduced compared with normal patients (0.39%, 0.17–5.1% p = 0.0323) (fig 2). Chronic HCV patients had slightly lower levels of mDCs (median 0.53%, range 0.16–2.08%) compared with normal patients (0.73%, 0.33–1.56%, p = 0.0245) (fig 2). In SVR+ patients (fig 3A), the per cent of pDCs increased significantly towards normal controls after therapy (median 0.31–0.36%, p = 0.0497), while in the SVR− patients, they did not (0.33–0.30%). In contrast, mDCs did not change significantly in either group (fig 3A). No significant pre-treatment differences in per cent pDCs or mDCs was noted comparing SVR+ and SVR− patients. Representative gating strategy for isolation of DC subtypes. Two million PBMCs were stained with BDCA-1–APC and BDCA-2–FITC. Additionally, PerCP and PE labelled antibodies were used to measure surface marker expression by four-colour flow cytometry. 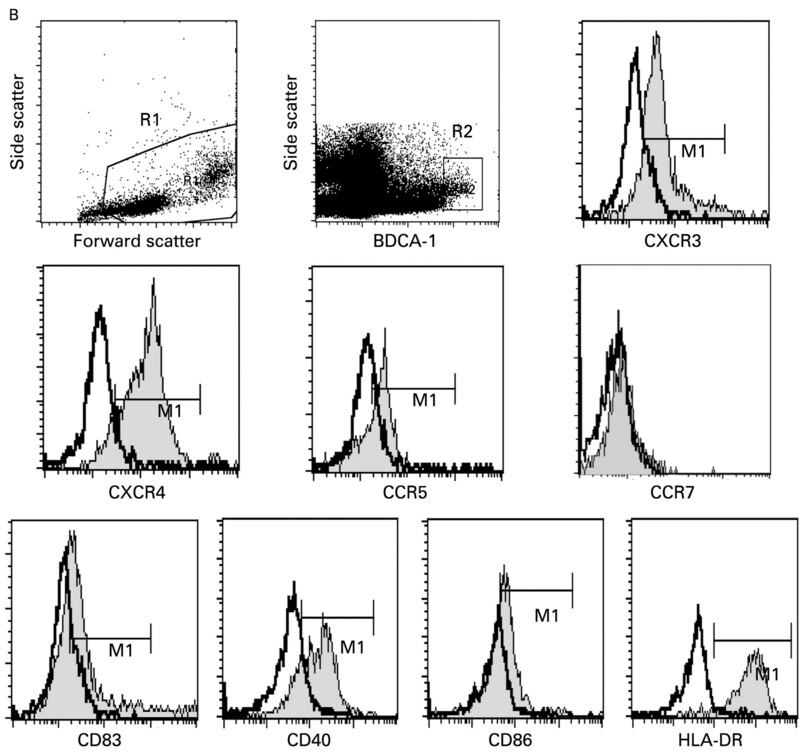 Forward scatter and side scatter identified and gated live cells in region 1 (R1) panels (A,B). Side scatter and either BDCA-2 (A, pDC) or BDCA-1 (B, mDC) were used to identify and gate DC subtypes in region 2 (R2).39 40 Overlay plots comparing isotype antibody controls with specific marker staining were used. The thicker line is the isotype control, the thinner line shaded with grey is staining with antibody to the protein indicated below the graph. The gate used is the horizontal bar labelled M1. (B) mDC gating and representative expression. Median fluorescence intensity in the gated region M1 was calculated by CellQuest Pro software and used in subsequent analysis. Comparison of plasmacytoid dendritic cells (pDCs) and myeloid dendritic cells (mDCs) between normal controls and hepatitis C virus (HCV) patients 2 weeks before starting therapy. SOO2 is the visit 2 weeks before initiation of therapy. FU24 is 24 weeks after cessation of treatment. Median fluorescence intensity (MFI) values for each patient are shown. The horizontal line is the median. A two-tailed Mann–Whitney test was used to calculate p values. (A) Per cent of cells in region R1 is shown, CXCR3 MFI, CXCR4 MFI and CCR5 MFI. (B) CD83, CD86, CD40, HLA-DR MFI. We also measured levels of the co-stimulatory molecules CD40 and CD86, MHC class II (HLA-DR), the maturation marker CD83, and the viral binding protein DC-SIGN. We observed that pre-treatment pDCs from patients had elevated levels of CD40 (median 234, range 102–2641) and CD83 (median 514, range 26–1860) compared with normal controls (147, 66–294, p = 0.0001; 50, 15–1065, p = 0.0002) (fig 2B). A significant decrease in CD40 and CD83 towards normal values occurred only in SVR+ patients (p = 0.0365, p = 0.0068, respectively, fig 3B) compared with SVR− patients whose levels remained elevated. Pre-treatment HLA-DR levels (median 275, range 79–635) were significantly lower on pDCs compared with normal controls (median 375, range 115–679) while mDCs were not significantly different (fig 2). SVR− patients had a small but statistically significant decrease in mDC HLA-DR MFI (p = 0.0102) after therapy while SVR+ patients did not (fig 3B). CD86 levels on mDCs were decreased compared with normal patients and no significant change in MFI occurred after therapy. CD86 expression was generally low to absent on pDCs from all groups (no increase above isotype control, fig 1A). 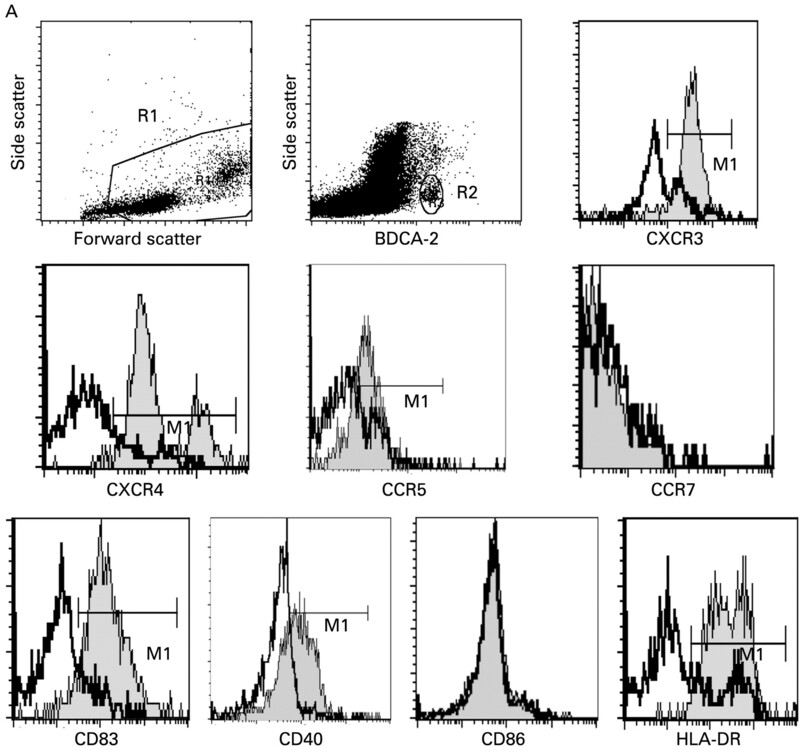 CD83 mDC levels were not significantly different from controls in all groups at all time points (fig 2 and data not shown). DC-SIGN was not detected on pDCs and mDCs in PBMC from all groups (data not shown). The associations between pre-treatment DC measurements described above and SVR were examined by weighted GEE-type regression analysis adjusted for race. In addition, we also examined a possible confounding effect of other clinical and laboratory characteristics of the cohort by including a subject’s gender, age, baseline histology using HAI scores, baseline viral levels, ALT level, and measurement of insulin resistance (HOMA) one at a time in each regression model. Overall, we did not observe significant association between DC markers and chemokines and SVR whether the model was adjusted or unadjusted for clinical and laboratory characteristics (data not shown). Since chemotaxis has such an important role in DC function, we next examined whether differences in chemokine surface receptor expression led to functional differences in DC chemotaxis. Because CXCR4 and CXCR3 chemokine receptors levels were elevated on pDC, and these levels decreased more in patients who had SVR, we decided to analyse the ability of DCs to migrate towards chemokines SDF-1 (CXCL12) and IP-10 (CXCL10), which signal through CXCR4 and CXCR3, respectively.32 We selected 20 patients (10 SVR+, 10 SVR−) with sufficient PBMCs for analysis from the original cohort of patients before and after HCV therapy. Overall, there was greater pDC and mDC migration towards CXCL12 than CXCL10 in both normal patients and chronic patients before therapy (fig 4). Combining all patients at timepoint S002, the mean chemotaxis index of pDC to CXCL12 was 4.708 versus 1.007 for CXCL10 (p<0.0001). Mean migration for mDCs was 6.533 to CXCL12 vs 1.255 to CXCL10 (p<0.0001). Pre-treatment migration of pDCs to CXCL12 was higher in SVR− patients (median 6.0, range 1.3–12) compared to SVR+ patients (median 3.8, range 1.4–5.4) (p = 0.0185, fig 4). Pre-treatment migration of pDCs to CXCL10 was also slightly higher in SVR− patients (median 1.29, range 0.69–1.7) vs (0.78 0.56–1.06, p = 0.0106, fig 4). Chemotaxis decreased after therapy but this change was not statistically significant. Myeloid DCs from SVR+ and SVR− patients showed no significant differences in their responses to CXCL12 or CXCL10 but the trends in migration were similar to pDCs (data not shown). Increasing pDC migration to CXCL12 correlated significantly with pre-treatment total HAI score (18 maximum points)37 48 and periportal+portal inflammation subscores (8 maximum points) (p = 0.0329, p = 0.0234, respectively; fig 5), but not lobular inflammation. There was no association between chemotaxis and viral level (data not shown). 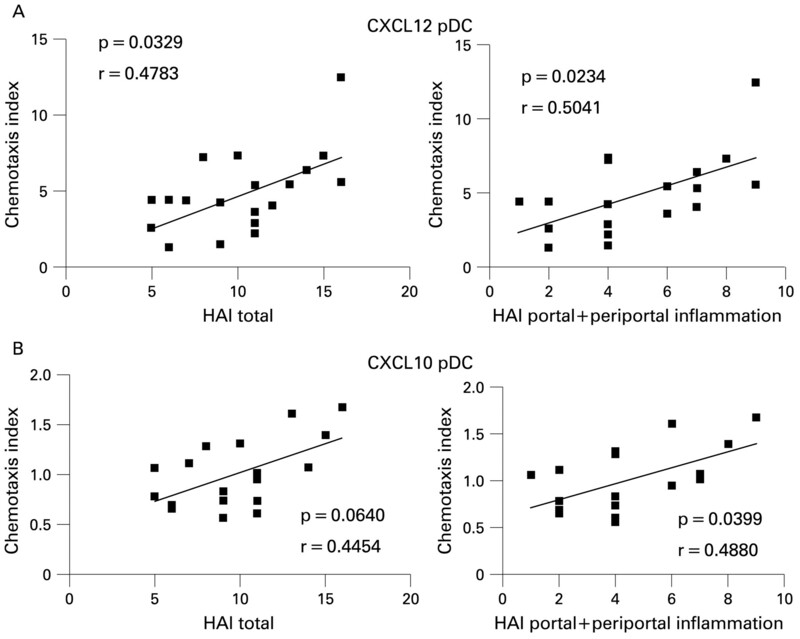 Migration of pDCs to CXCL10 directly correlated with periportal+portal inflammation (p = 0.0399) but only approached statistical significance for total HAI score (p = 0.0640; fig 5). In contrast, mDC migrations to CXCL12 and CXCL10 were not significantly associated with inflammation (data not shown). Differential elevations of chemokine receptors and maturation markers in dendritic cell (DC) subtypes before and after therapy. SOO2 is screening visit 2, 2 weeks before initiation of therapy. FU24 is 24 weeks after cessation of treatment. Median fluorescence intensity (MFI) values for each patient are shown. The horizontal line is the median. A two-tailed non-parametric Wilcoxon signed rank test was used for paired data or the two-tailed Mann–Whitney test was used to calculate p values. (B) CD83 MFI on pDCs, mDCs; CD40 MFI for pDCs, mDCs; HLA-DR for pDCs and mDCs. Increased baseline plamacytoid dendritic cell (pDC) chemotaxis to CXCL12, CXCL10 in SVR− patients. Ten SVR+ and 10 SVR− patients from the original cohort of 64 patients were compared with seven normal controls. Chemotaxis index (CI) was defined as the number of cells migrated with chemokine divided by the number of cells that migrated without chemokine. CXCL12 was used at 200 ng/ml, CXCL10 at 1 μg/ml. The Mann–Whitney test or the Wilcoxon signed rank test (for paired samples) was used to calculate p values. The horizontal line is the median. (A) Chemotaxis of pDCs to CXCL12. (B) Chemotaxis of pDCs to CXCL10 (note: 9/10 patients studied in the SVR− group had sufficient PBMCs for study). HCV may inhibit the immune response of DCs, hindering the adaptive response from T cells.13 47 We hypothesised that DC dysfunction may determine the response to PEG-IFN/ribavirin therapy. In this large HCV treatment study of 64 patients, using ex vivo analysis, we found that pDCs and mDCs were decreased compared to normal controls, consistent with prior studies in HCV and similar to prior studies of patients with HIV.13 18 19 38 44 45 49 For the first time, we found that pDCs from HCV patients had elevated levels of the inflammatory chemokine receptors CXCR4 and CXCR3 before therapy, and, importantly, successful therapy was associated with larger decreases in expression levels. High chemokine and inflammatory cytokine levels in the blood of HCV patients likely increases chemokine receptor expression.32 The co-stimulatory molecule CD40 and the maturation marker CD83 were elevated on pDCs and decreased with SVR. Lower pre-treatment HLA-DR was seen on pDCs in HCV patients compared to normal controls. The maturation marker DC-SIGN, and the co-stimulatory molecule CD86 were not elevated, suggesting that pDCs in the blood had not achieved full maturation. Individual baseline DC marker phenotype did not predict SVR, including data analysis by race comparing Caucasians versus African–Americans. Increased plasmacytoid dendritic cell (pDC) chemotaxis to CXCL12, CXCL10 correlates with inflammation. Combining all 20 patients together, chemotaxis index at S002 (pre-treatment) was plotted against the total histological activity index (HAI)37 48 (total 0–18) which includes a sub-score for periportal inflammation, portal inflammation, and fibrosis from the patients’ liver biopsy. The p value and correlation coefficient R for the association between the variables is shown. Analysis performed by GraphPad Prism software using the two-tailed Spearman’s test. (A) CXCL12 pDC total HAI score, CXCL12 periportal+portal HAI score. (B) CXCL10 pDC total HAI score, CXCL10 pDC periportal+portal HAI score. Fully activated DCs express the chemokine receptor CCR7 which is important for lymph node homing, HL-DR for antigen presentation, co-stimulatory and maturation markers like CD40, CD86 and CD83.14 Partial or incomplete activation seen in our study has also been described in DCs from other chronic viral infections, such as HIV.38 A recent study of HIV patients showed elevated CD40 on mDCs and pDCs with low CD86, with even higher levels of CD40 seen in lymph nodes.38 In chronic HCV, this phenotype may result from chronic infection and inflammation in the liver and peripheral blood that is not sufficiently robust enough to cause full activation. These partially activated pDCs may be poor presenters of antigen because of low MHC surface levels and poor activators of T cells because they have low levels of co-stimulatory molecules. However, we recognise a limitation of our study was that we sampled DCs from the peripheral blood, a compartment where they are transiently; thus, we might be observing partial activation occurring secondary to inflammatory cytokine stimulation before DC migration to areas of inflammation. Why is increased baseline inflammation associated with a poorer response to therapy? Recent studies of gene expression in liver biopsy samples and PBMCs have demonstrated that patients with higher levels of interferon-stimulated genes before therapy have a poorer response to interferon/ribavirin.50–52 These results suggest that non-responding patients already have maximal interferon responses and that adding additional interferon does not augment the antiviral immune response. In summary, pDCs from patients with chronic HCV analysed directly ex vivo show increased inflammatory chemokine receptor expression and a partial activation phenotype that suggests pDC dysfunction. Successful antiviral therapy normalises many phenotypic and functional abnormalities of pDCs from patients with HCV. Our finding that pDCs in SVR− patients demonstrate increased chemotaxis before therapy reinforces the hypothesis that increased baseline inflammation is associated with failure to respond to antiviral therapy. It remains to be determined if DC migration from liver to lymph node and/or antigen presentation to T cells is inhibited in vivo. Further functional studies of HCV DCs may lead to improved immune-boosting therapies for viral eradication. The authors would like to thank the patients and clinical centres from the Virahep-C study.
. Hepatitis C. virus infection. N Engl J Med 2001;345:41–52.
. Studying hepatitis C virus: making the best of a bad virus. J Virol 2007;81:8853–67.
. Adaptive immune responses in acute and chronic hepatitis C virus infection. Nature 2005;436:946–52.
. Peginterferon and ribavirin for chronic hepatitis C. N Engl J Med 2006;355:2444–51.
. Impaired effector function of hepatitis C virus-specific CD8+ T cells in chronic hepatitis C virus infection. J Immunol 2002;169:3447–58.
. Mechanisms of disease: HCV-induced liver injury. Nat Clin Pract Gastroenterol Hepatol 2007;4:622–34.
. Sustained dysfunction of antiviral CD8+ T lymphocytes after infection with hepatitis C virus. J Virol 2001;75:5550–8.
. Division of labor, plasticity, and crosstalk between dendritic cell subsets. Curr Opin Immunol 2008;20:61–7.
. Plasmacytoid dendritic cells in immunity. Nat Immunol 2004;5:1219–26.
. Altered innate immunity in chronic hepatitis C infection: cause or effect? Hepatology 2007;46:1279–90.
. Dendritic cells and immune regulation in the liver. Gut 2003;52:307–14.
. Decreased immunogenicity of recombinant hepatitis B vaccine in chronic hepatitis C. Hepatology 2000;31:230–4.
. Association between hepatitis C infection and other infectious diseases: a case for targeted screening? Am J Gastroenterol 2003;98:167–74.
. Impaired allostimulatory function of dendritic cells in chronic hepatitis C infection. Gastroenterology 2001;120:512–24.
. Direct enumeration and functional assessment of circulating dendritic cells in patients with liver disease. Hepatology 2004;40:335–45.
. Subversion of plasmacytoid and myeloid dendritic cell functions in chronic HCV infection. Immunobiology 2005;210:237–47.
. Impaired dendritic cell maturation in patients with chronic, but not resolved, hepatitis C virus infection. Blood 2001;97:3171–6.
. Impaired allostimulatory capacity of peripheral blood dendritic cells recovered from hepatitis C virus-infected individuals. J Immunol 1999;162:5584–91.
. Plasmacytoid dendritic cells in acute and chronic hepatitis C virus infection. Hepatology 2005;41:643–51.
. 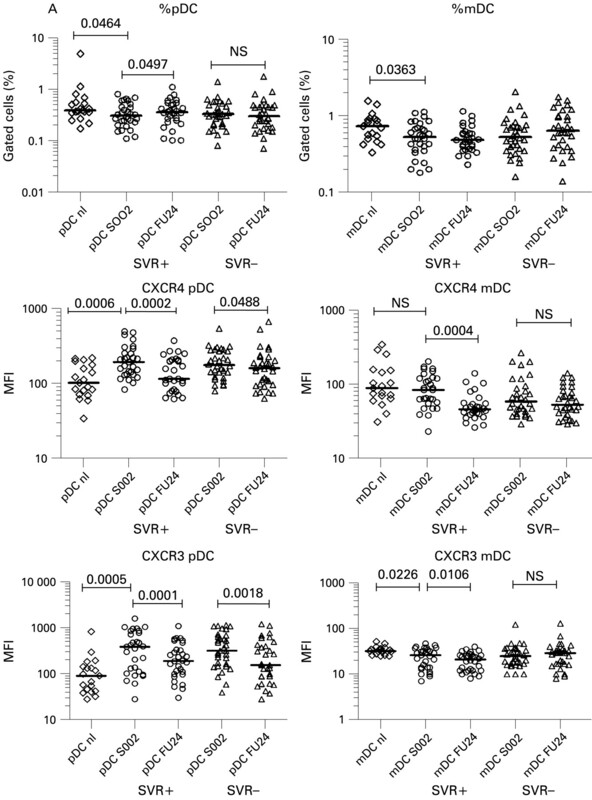 Impaired cytokine response in myeloid dendritic cells in chronic hepatitis C virus infection regardless of enhanced expression of Toll-like receptors and retinoic acid inducible gene-I. J Med Virol 2008;80:980–8.
. TLR ligand-dependent activation of naive CD4 T cells by plasmacytoid dendritic cells is impaired in hepatitis C virus infection. J Immunol 2007;178:4436–44.
. Plasmacytoid dendritic cells initiate a complex chemokine and cytokine network and are a viable drug target in chronic HCV patients. J Exp Med 2007;204:2423–37.
. Presence of functional dendritic cells in patients chronically infected with hepatitis C virus. Blood 2004;103:1026–9.
. Normal functional capacity in circulating myeloid and plasmacytoid dendritic cells in patients with chronic hepatitis C. J Infect Dis 2005;192:497–503.
. Lack of phenotypic and functional impairment in dendritic cells from chimpanzees chronically infected with hepatitis C virus. J Virol 2004;78:6151–61.
. Monocyte derived dendritic cells retain their functional capacity in patients following infection with hepatitis C virus. J Viral Hepat 2008;15:219–28.
. Hepatitis C virus E2 and CD81 interaction may be associated with altered trafficking of dendritic cells in chronic hepatitis C. Hepatology 2006;44:945–54.
. Hepatitis C virus (HCV) core protein-induced, monocyte-mediated mechanisms of reduced IFN-alpha and plasmacytoid dendritic cell loss in chronic HCV infection. J Immunol 2006;177:6758–68.
. Chemokines in hepatitis C virus infection: pathogenesis, prognosis and therapeutics. Cytokine 2007;39:50–62.
. Interferon (IFN)-gamma-inducible protein-10: association with histological results, viral kinetics, and outcome during treatment with pegylated IFN-alpha 2a and ribavirin for chronic hepatitis C virus infection. J Infect Dis 2006;194:895–903.
. IP-10 predicts viral response and therapeutic outcome in difficult-to-treat patients with HCV genotype 1 infection. Hepatology 2006;44:1617–25.
. Elevated levels of interleukin-8 in serum are associated with hepatitis C virus infection and resistance to interferon therapy. J Virol 2001;75:6209–11.
. Involvement of the CXCL12/CXCR4 pathway in the advanced liver disease that is associated with hepatitis C virus or hepatitis B virus. Eur J Immunol 2004;34:1164–74.
. Peginterferon and ribavirin treatment in African American and Caucasian American patients with hepatitis C genotype 1. Gastroenterology 2006;131:470–7.
. Plasmacytoid and myeloid dendritic cells with a partial activation phenotype accumulate in lymphoid tissue during asymptomatic chronic HIV-1 infection. J Acquir Immune Defic Syndr 2008;48:1–12.
. BDCA-2, BDCA-3, and BDCA-4: three markers for distinct subsets of dendritic cells in human peripheral blood. J Immunol 2000;165:6037–46.
. BDCA-2, a novel plasmacytoid dendritic cell-specific type II C-type lectin, mediates antigen capture and is a potent inhibitor of interferon alpha/beta induction. J Exp Med 2001;194:1823–34.
. Characterization of human blood dendritic cell subsets. Blood 2002;100:4512–20.
. Characterization of human liver dendritic cells in liver grafts and perfusates. Liver Transpl 2006;12:384–93.
. Hepatitis C is associated with perturbation of intrahepatic myeloid and plasmacytoid dendritic cell function. J Hepatol 2007;47:338–47.
. Selective impairments in dendritic cell-associated function distinguish hepatitis C virus and HIV infection. J Immunol 2004;172:4907–16.
. Reduced numbers and impaired ability of myeloid and plasmacytoid dendritic cells to polarize T helper cells in chronic hepatitis C virus infection. 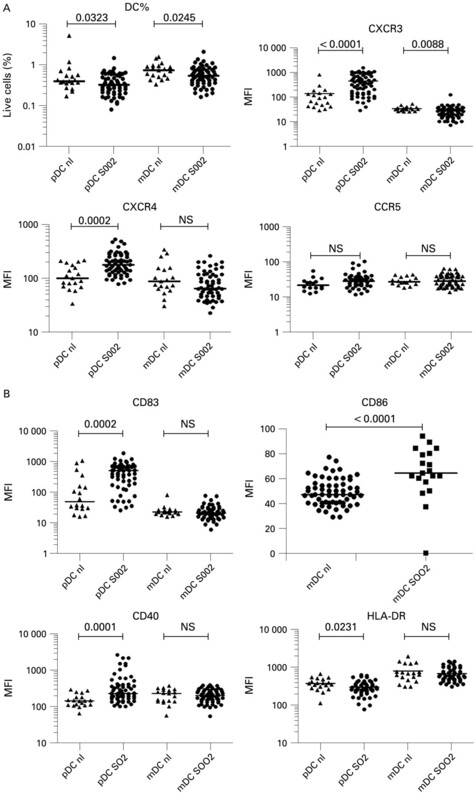 J Infect Dis 2004;190:1919–26.
. Human peripheral blood dendritic cells and monocyte subsets display similar chemokine receptor expression profiles with differential migratory responses. Scand J Immunol 2007;65:514–24.
. Cell culture-produced hepatitis C virus impairs plasmacytoid dendritic cell function. Hepatology 2008;47:385–95.
. Influence of plasma viremia on defects in number and immunophenotype of blood dendritic cell subsets in human immunodeficiency virus 1-infected individuals. J Infect Dis 2003;187:26–37.
. Hepatic gene expression discriminates responders and nonresponders in treatment of chronic hepatitis C viral infection. Gastroenterology 2005;128:1437–44.
. Lack of response to exogenous interferon-alpha in the liver of chimpanzees chronically infected with hepatitis C virus. Hepatology 2007;46:999–1008.
. Intrahepatic interferon-stimulated gene responses: can they predict treatment responses in chronic hepatitis C infection? Hepatology 2007;46:1326–8. Funding: JAM is supported by T32 DK7038-32. This work is supported by RO1 DK071560 (to HRR). This study was funded as a cooperative agreement by the National Institute of Diabetes and Digestive and Kidney Diseases (NIDDK) and the Intramural Research Program of the National Cancer Institute (NCI) with further support under a Cooperative Research and Development Agreement (CRADA) with Roche Laboratories, Inc. A complete listing of participants in the Virahep-C study is given in reference 37. Grant numbers: U01 DK60329, U01 DK60340, U01 DK60324, U01 DK60344, U01 DK60327, U01 DK60335, U01 DK60352, U01 DK60342, U01 DK60345, U01 DK60309, U01 DK60346, U01 DK60349, U01 DK60341. Ethics approval: The protocol and consent form were approved by the institutional review boards of the participating institutions. All patients gave informed, written consent. The clinical trial has already been published in reference 37. © Mengshol et al 2009 This is an open-access article distributed under the terms of the Creative Commons Attribution Non-commercial License, which permits unrestricted use, distribution, and reproduction in any medium, provided the original work is properly cited.